Journal of the House of Lords Volume 25, 1737-1741. Originally published by His Majesty's Stationery Office, London, 1767-1830. Epus. Landavens. Ds. Hardwicke, Cancellarius. Dux Athol, & Ds. Strange. Dux Ancaster & Kesteven, Magnus Camerarius Angl. "I thank you very kindly for this most seasonable and dutiful Address. The true Concern you shew, for the Assistance of the Queen of Hungary, and the Support of the House of Austria, is very agreeable to Me. "The Assurance you give Me, in relation to My Territories Abroad, is a strong Proof of your Affection to Me: And you may depend on My making no other Use of the Confidence you repose in Me, than to enable Me to act with Vigour in maintaining the Pragmatic Sanction, and in the Preservation of the Balance and Liberties of Europe, and of our common Interest and Security." Ordered, That the said Address, and His Majesty's most Gracious Answer thereunto, be forthwith printed and published. The House (according to Order) was adjourned during Pleasure, and put into a Committee upon the Bill, intituled, "An Act to enable the Commissioners for building a Bridge cross the River Thames, from the City of Westminster, to the opposite Shore in the County of Surrey, to raise a further Sum of Money, towards finishing the said Bridge, and to perform the other Trusts reposed in them; and for exchanging of Tickets unclaimed in the Westminster Bridge Lottery of the Twelfth Year of His present Majesty's Reign; and for making Provision for Tickets in the said Lottery, lost, burnt, or otherwise destroyed." After some Time, the House was resumed. And the Earl of Warwick reported from the said Committee, "That they had gone through the Bill, and directed him to report the same to the House, without any Amendment." Upon reading the Petition of Francis D'Abbadie; praying, "That Leave may be given to bring in a Bill, for his Naturalization:"
It is Ordered, That Leave be given to bring in a Bill, as desired. Accordingly, the Duke of Bridgewater presented to the House a Bill, intituled, "An Act for naturalizing Francis D'Abbadie." And the same was read the First Time. Then the said Francis D'Abbadie took the Oaths appointed, in order to his Naturalization. Thwaites & al. Liberty to appeal. 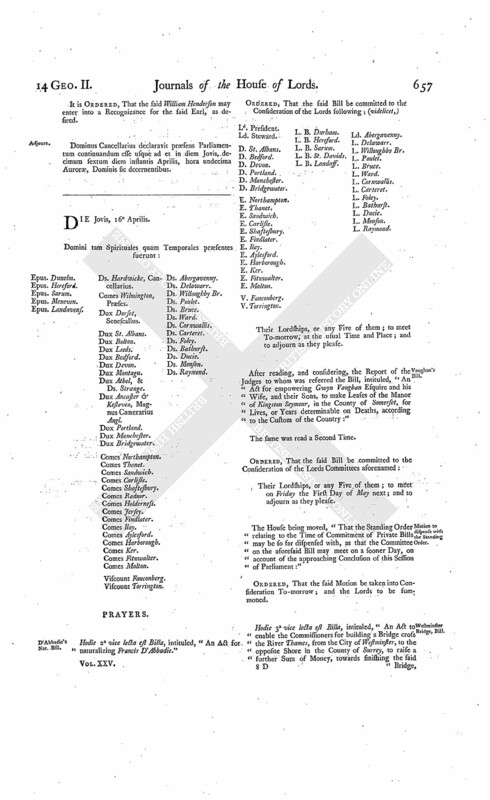 The Order of the Day being read, for hearing One Counsel of a Side, upon the Petition of Ephraim Thwaites and Anne his Wife (who is the Heiress at Law), and of Francis Huish Clerk, the Devisee, of John Vernon, deceased, Respondents to the Appeal of Jane Vernon Widow, Executrix and Devisee of Thomas Vernon Esquire, deceased; complaining of a Decree, or Order of Dismission, of the Court of Chancery in Ireland, made in the Year 1686; praying Liberty to prefer their Appeal to this House, to complain also of the said Decree or Order; and that the Appeal of the said Jane Vernon may be adjourned over till the next Session of Parliament, in order that both Appeals may come on to be heard together. It is Ordered, That the Petitioners the said Ephraim Thwaites and others have Liberty to exhibit to this House an Appeal, according to the Prayer of their Petition. Henderson to enter into a Recognizance for the Earl of Anglesey. The House being moved, "That William Henderson Gentleman may be permitted to enter into a Recognizance for Richard Earl of Anglesey, on account of his Appeal depending in this House; his Lordship being in Ireland:"
It is Ordered, That the said William Henderson may enter into a Recognizance for the said Earl, as desired. Dominus Cancellarius declaravit præsens Parliamentum continuandum esse usque ad et in diem Jovis, decimum sextum diem instantis Aprilis, hora undecima Auroræ, Dominis sic decernentibus. Hodie 2a vice lecta est Billa, intituled, "An Act for naturalizing Francis D'Abbadie." V. Torrington. L. B. Durham. L. B. Landaff. Ld. Abergavenny. Their Lordships, or any Five of them; to meet To-morrow, at the usual Time and Place; and to adjourn as they please. 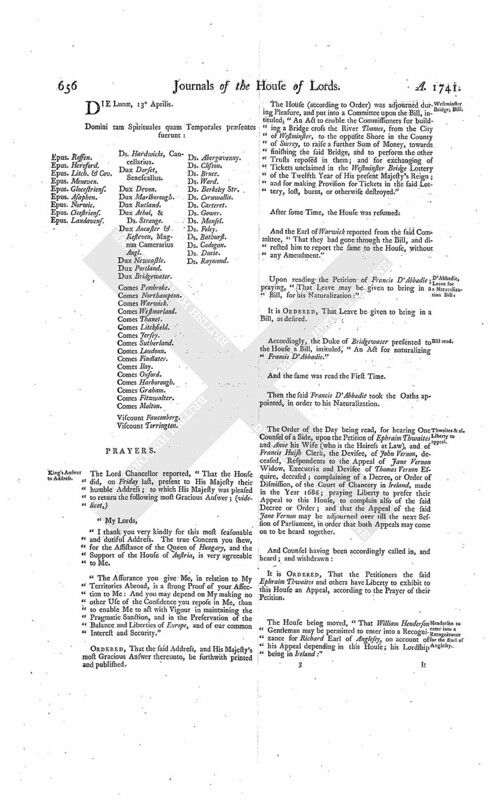 After reading, and considering, the Report of the Judges to whom was referred the Bill, intituled, "An Act for empowering Gwyn Vaughan Esquire and his Wife, and their Sons, to make Leases of the Manor of Kingston Seymour, in the County of Somerset, for Lives, or Years determinable on Deaths, according to the Custom of the Country:"
The same was read a Second Time. Their Lordships, or any Five of them; to meet on Friday the First Day of May next; and to adjourn as they please. Motion to dispense with the Standing Order. 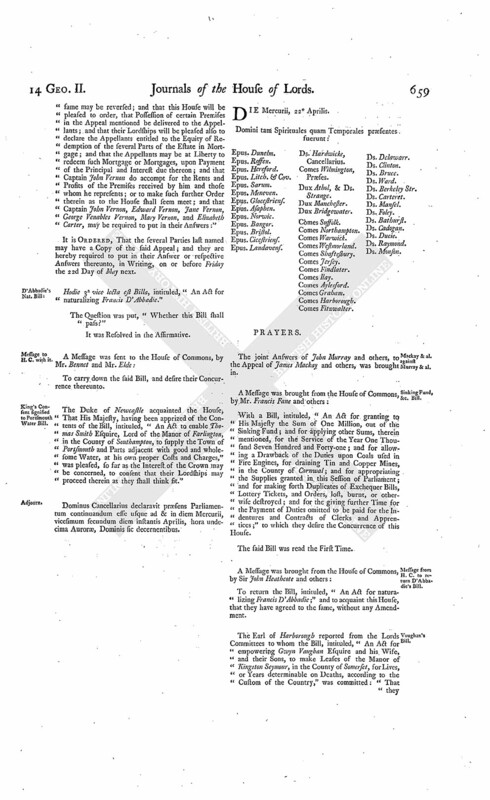 The House being moved, "That the Standing Order relating to the Time of Commitment of Private Bills may be so far dispensed with, as that the Committee on the aforesaid Bill may meet on a sooner Day, on account of the approaching Conclusion of this Session of Parliament:"
Ordered, That the said Motion be taken into Consideration To-morrow; and the Lords to be summoned. Hodie 3a vice lecta est Billa, intituled, "An Act to enable the Commissioners for building a Bridge cross the River Thames, from the City of Westminster, to the opposite Shore in the County of Surrey, to raise a further Sum of Money, towards finishing the said Bridge, and to perform the other Trusts reposed in them; and for exchanging of Tickets unclaimed in the Westminster Bridge Lottery of the Twelfth Year of His present Majesty's Reign; and for making Provision for Tickets in the said Lottery lost, burnt, or otherwise destroyed." Message to H. C. that the Lords have agreed to it. Hodie 2a vice lecta est Billa, intituled, "An Act to enable Thomas Smith Esquire, Lord of the Manor of Farlington, in the County of Southampton, to supply the Town of Portsmouth and Parts adjacent with good and wholesome Water, at his own proper Costs and Charges." Their Lordships, or any Five of them; to meet on Wednesday next, at the usual Time and Place; and to adjourn as they please. Dominus Cancellarius declaravit præsens Parliamentum continuandum esse usque ad et in diem Veneris, decimum septimum diem instantis Aprilis, hora undecima Auroræ, Dominis sic decernentibus. Comes Graham. Ds. Harrington, Unus Primariorum Secretariorum. The Duke of Bridgewater reported from the Lords Committees to whom the Bill, intituled, "An Act for naturalizing Francis D'Abbadie," was committed: That they had considered the said Bill, and examined the Allegations thereof, which they found to be true; and that the Committee had gone through the Bill, and directed him to report the same to the House, without any Amendment." Ordered, That the said Bill be engrossed. Mercer, to amend his Appeal. Upon reading the Petition of Robert Mercer Gentleman; setting forth, "That, in his Appeal from a Decree of the Court of Chancery in Ireland, John Butler, One of the Executors of Thomas Butler deceased, is, by Mistake, said therein to be the Son and Heir and Executor of the said Thomas Butler, whereas he is only Executor; and that John Butler Esquire, the Son and Heir of the said Thomas Butler, is omitted being made a Respondent, though the Petitioner is advised it is necessary he should be made a Party;" and praying, "That the Petitioner may be at Liberty to amend his said Appeal in the Particulars aforesaid, and to make the last mentioned John Butler a Party thereto:"
It is Ordered, That the Petitioner be at Liberty to amend his said Appeal, as desired; and to make John Butler a Respondent thereto. The House (according to Order) proceeded to take into Consideration the Motion made Yesterday, for dispensing with the Standing Order of this House relating to the Time of Commitment of Private Bills, so far as that the Committee to whom the Bill, intituled, "An Act for empowering Gwyn Vaughan Esquire and his Wife, and their Sons, to make Leases of the Manor of Kingston Seymour, in the County of Somerset, for Lives, or Years determinable on Deaths, according to the Custom of the Country," stands committed, may meet on a sooner Day than was at first appointed. Ordered, That the said Standing Order be so far dispensed with, in this Case, as that the said Committee may meet, to consider of the said Bill, on Wednesday next. Conviction of Offenders returning from Transportation, Bill. 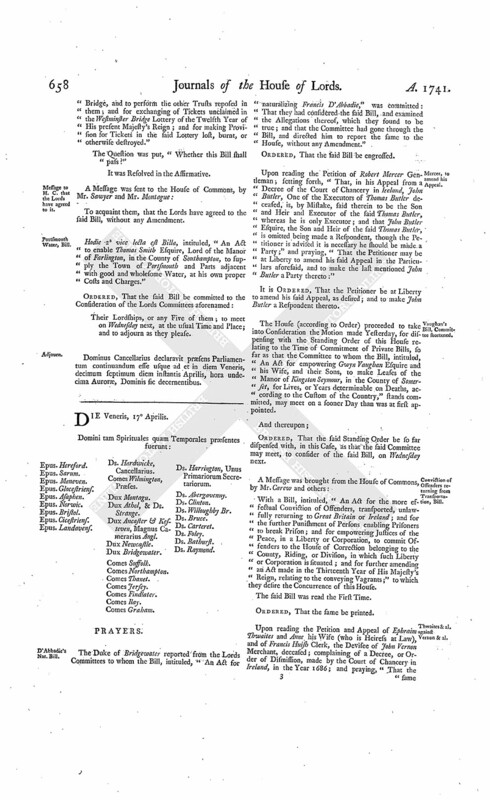 With a Bill, intituled, "An Act for the more effectual Conviction of Offenders, transported, unlawfully returning to Great Britain or Ireland; and for the further Punishment of Persons enabling Prisoners to break Prison; and for empowering Justices of the Peace, in a Liberty or Corporation, to commit Offenders to the House of Correction belonging to the County, Riding, or Division, in which such Liberty or Corporation is situated; and for further amending an Act made in the Thirteenth Year of His Majesty's Reign, relating to the conveying Vagrants;" to which they desire the Concurrence of this House. Ordered, That the same be printed. Thwaites & al. against Vernon & al. Upon reading the Petition and Appeal of Ephraim Thwaites and Anne his Wife (who is Heiress at Law), and of Francis Huish Clerk, the Devisee of John Vernon Merchant, deceased; complaining of a Decree, or Order of Dismission, made by the Court of Chancery in Ireland, in the Year 1686; and praying, "That the same may be reversed; and that this House will be pleased to order, that Possession of certain Premises in the Appeal mentioned be delivered to the Appellants; and that their Lordships will be pleased also to declare the Appellants entitled to the Equity of Redemption of the several Parts of the Estate in Mortgage; and that the Appellants may be at Liberty to redeem such Mortgage or Mortgages, upon Payment of the Principal and Interest due thereon; and that Captain John Vernon do accompt for the Rents and Profits of the Premises received by him and those whom he represents; or to make such further Order therein as to the House shall seem meet; and that Captain John Vernon, Edward Vernon, Jane Vernon, George Venables Vernon, Mary Vernon, and Elizabeth Carter, may be required to put in their Answers:"
It is Ordered, That the several Parties last named may have a Copy of the said Appeal; and they are hereby required to put in their Answer or respective Answers thereunto, in Writing, on or before Friday the 22d Day of May next. Hodie 3a vice lecta est Billa, intituled, "An Act for naturalizing Francis D'Abbadie." Message to H. C. with it. To carry down the said Bill, and desire their Concurrence thereunto. King's Consent signified to Portsmouth Water Bill. The Duke of Newcastle acquainted the House, That His Majesty, having been apprized of the Contents of the Bill, intituled, "An Act to enable Thomas Smith Esquire, Lord of the Manor of Farlington, in the County of Southampton, to supply the Town of Portsmouth and Parts adjacent with good and wholesome Water, at his own proper Costs and Charges," was pleased, so far as the Interest of the Crown may be concerned, to consent that their Lordships may proceed therein as they shall think fit." Dominus Cancellarius declaravit præsens Parliamentum continuandum esse usque ad & in diem Mercurii, vicesimum secundum diem instantis Aprilis, hora undecima Auroræ, Dominis sic decernentibus.